Apple CEO Tim Cook was interviewed (briefly and lightly) on a morning talk show today on Apple's role in the US govt's latest ed tech initiative, ConnectED, as well as other Apple miscellany. 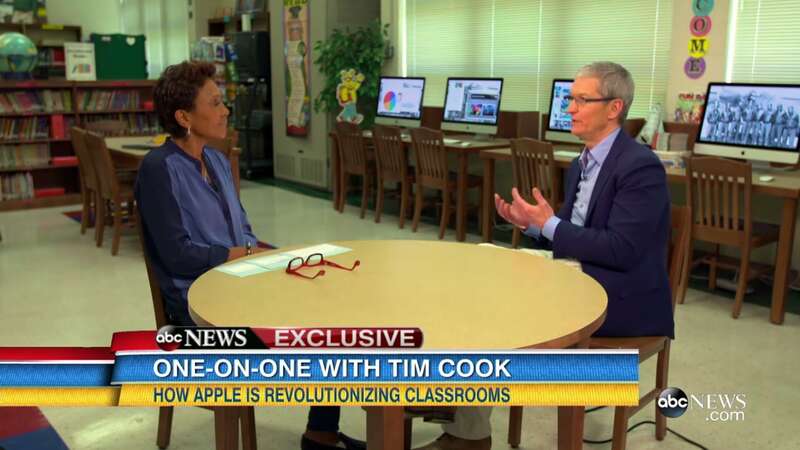 "I think technology has to be a key part [of education] and that’s why we’re here," Cook told GMA. "Too many times today kids aren't given the right for a great public education and this isn't right. It's not fair." He added: "Kids today, they're born in a digital world, but too many kids, when it comes time for the 8 o’clock bell to ring, go to an analog world." You can watch the segment over at Yahoo (embedding is disabled) or read the ABC story on Go.com. The ultimate goal of the ConnectED program (not to be confused with McGraw-Hill's etextbook platform of the same name) is to get 99% of American students connected to the internet through high-speed broadband and high-speed wireless within 5 years. Fewer than 20 percent of educators across the country say their school’s Internet connection meets their teaching needs, leaving tens of millions of students with little or no access to the online standardized testing required to meet state and federal standards. The ConnectED program launched in 2013, and is set to be complete by 2018.